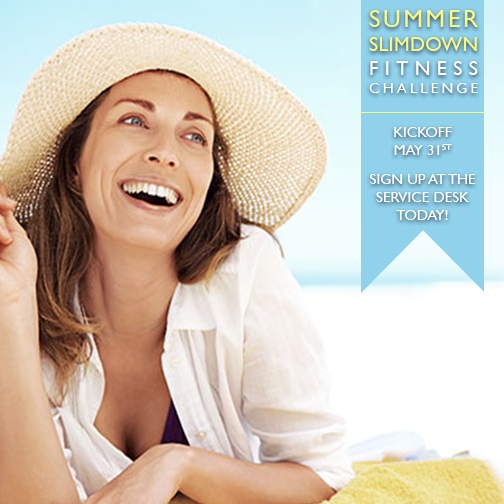 Summer is right around the corner and our Summer Slim Down Fitness Challenge is the best way to keep yourself motivated and looking your best during the summer months. Joining our fitness challenge is the accountability you need to achieve your fitness and wellness goals. Without accountability, it's hard to be consistent. Consistency is key in changing your habits and your body. We provide you with a fitness challenge as a tool to keep you motivated, committed and consistent, paving the way for you to reach your goals while being rewarded for your hard work and dedication. Sign up at the service desk today. For more program information or any questions at all, call Melanie 896-3900 x142!